HAMDEN, Conn. Netsolace, the premier provider of customizable technology solutions for franchisors, announced today a strategic alliance with Michael H. Seid & Associates (MSA), the franchise industry’s leading consulting company. Netsolace and MSA have teamed up to educate franchisors on the benefits of integrating seamless technology and training into their franchise systems and supplying them with a solution to improve the support they deliver to their franchisees. Netsolace and MSA leverage their expertise to provide franchise solutions that range from business consulting, strategic and tactical advice and assessment in the planning and implementation of a technology infrastructure designed to increase efficiency and profitability. Each company provides its clients tailored and cost-effective, end-to-end solutions that help franchise systems realize greater success. Founded by Tariq Farid, CEO of Edible Arrangements, Netsolace is a technology company that provides cutting-edge, customizable technology solutions for the franchise industry. Designed originally for Edible Arrangements, Netsolace offers a suite of software solutions that help franchisors manage the four critical areas of any franchise organization — financial management, operations, communications and training — and provides their franchisees with the tools they need in growing and managing their businesses. Netsolace’s web-based applications can be accessed from anywhere and are designed to support the franchisor and franchisee by providing real-time information for comprehensive data analysis and management reporting. As part of Netsolace’s integrated technology offering, a multimedia training program called nXstep(R) is offered that includes text, video and audio elements. The training modules are Internet-accessible and allow for immediate updates regarding any changes in the franchise system. MSA is a domestic and international franchise advisory firm with a reputation for providing franchise clients with the tools to create and sustain their competitive advantage. Providing strategic and tactical advisory services to clients, ranging from established Fortune 50 brands to small, emerging concepts, MSA’s reputation has been built on delivering practical advice and solutions, creating opportunities for their clients to grow their franchise system to the next level. MSA’s services include manuals and training programs, restaurant development and management, mergers and acquisitions, domestic and international growth strategies and litigation support. Headquartered in Hamden, CT, Netsolace is a technology company that provides ground-breaking solutions for the franchise industry. 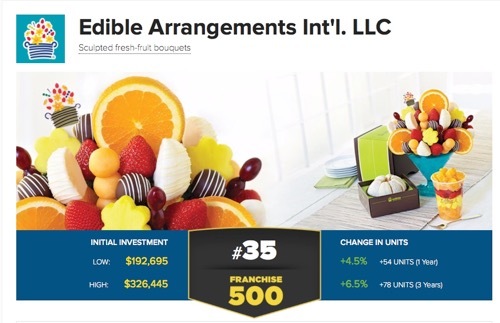 Developed by Tariq Farid, founder and CEO of Edible Arrangements, Netsolace offers an integrated enterprise technology platform that Tariq discovered was needed when he began selling multi-unit agreements at Edible Arrangements. For additional information, please call Khurram Mirza, 203.907.2807 or visit www.netsolace.com. Managed by Michael Seid and Kay Ainsley, MSA is the leading provider of strategic and tactical services to established and emerging franchisors domestically and internationally. For additional information, please call 860.523.4257 or visit www.msaworldwide.com. One of America’s most successful entrepreneurs, Tariq Farid is the Founder and Chief Executive Officer of Edible Arrangements International, the pioneer and worldwide leader of high quality, artistically designed fresh fruit arrangements. He is responsible for setting the company’s strategic direction and for the licensing of new franchises across the United States as well as internationally. Copyright @ 2016 TariqFarid.com. All Rights Reserved.